"xe.eeragan MioudStn\\Bi0\\8. vioudStb Wet ofuSnd IrewaerndWo)\\86(xs leFim raogPr:\\C"="46627D33292D6BE500A0B4E2207C52BA684C8E1E2329648398C2B4CAE76D2E78 7E"
"xe.eeragan MioudStn\\Bi0\\8. vioudStb Wet ofuSnd IrewaerndWo)\\86(xs leFim raogPr:\\C"="FF88C5720EF9B06A3465D1DCDF9C48D4DC28100BDE5E5A415D8200BC2DE7B364 44"
Why not post the key generator? as we can understand you have the key generator. this good forum extending only for repeated asking of keys.not for any constructive interactions. the key generator file is simply an exe file small in size.then why you not uploading this one.please let us know what is the reason for that? I do not use in a virtual machine? I can not open KeyGen.bat, you can tell me how to open the way. Only the programming only read site code, you can build Site Key it? I have an error. Everytimes i try to run the .bat files, it shows me: "Sorry, this application cannot run under a Virtual Machine" even I'm not. I run it once on my laptop (Windows 8.1 Pro, 64 Bits), once on my company PC (windows 10 Enterprise, 64 Bits). Can you help me? Can you send me the instructions for the crack and how is the process to crack please? If you are trying execute the keygen in Win10, you need to run the code of the .bat file in the prompt with admin privileges. How do I use this program to generate the code IWS paragraph 7.1 8.0 UO ? So am new on this site, I'm reading this forum from the beginning. And trying to understand how valiar my IWS 8.0. 2 - I downloaded the archive last link, and came two files "KegGen.dll" and "KeyGen - x64" what should I do with them? Copy to any folder? Tried executalos more nothing happens. 3 - In the forum says I have to copy the files to the folder instalção, are these two archive up? and so I did porrem does nothing, right? Only a black screen opens and closes, this correct? 5th - My Regedit is the 6.1 that will change anything? All answers I see refers to Regedit 5.0. 6 - What should I check in Regedit? I change something? 7 - I see that many only repassão data and Mr. PDLFFALF to respond with a code of regdit what is it? And how use this idea? Would you like to learn to generate this code as well. Good friends, as you might notice I am layman in this matter. And tenhos many doubts. What I seek is a step by step to lay people like me. I'm sure it should not be difficult, but when you translate the conversation, some words do not understand. Pesso descupas now. And here I leave my Many fought! don't works. I'm not sure if I'm doing all correctly. Keygen puts in the register the correct key but IWS is unlicensed. I try put in the key code the site code changing the last two numbres for 8887 3C by example but the register program of IWS blocks and close. Can you help me please? please send me site key!!!!! First Thanks so much PDLFFALF, every time help us!!! Inside this link below there is one procedure, with some steps, but in sometime when it includes the last caracter "3C", it doesn't running well. Just you will need remove this last caracter. Case you get in IWS and don't able to license. Make again the procedure and remove "3C". Remove os últimos dígitos ai vai funcionar na hora. for KeyGen - x64 work is necessary to use Windows x64 ? because mine is x32 , so what does not? para o KeyGen - x64 funcionar é necessario utilizar windows x64? pois o meu é x32, por isso que não funciona? What's wrong please? someone could help us explaining how to do it correctly? for those not work, please remember to change to softkey activation. may i know what is the password to extract the zip file "driver toolkit", "screen xml api" and "tag database access toolkit " BI dashboard ? I was definitively dumb... For now I'm ok with the licence check! Run the 'KegGen.dll' with 'Studio Manager.exe' in the 'bin' folder of the software. 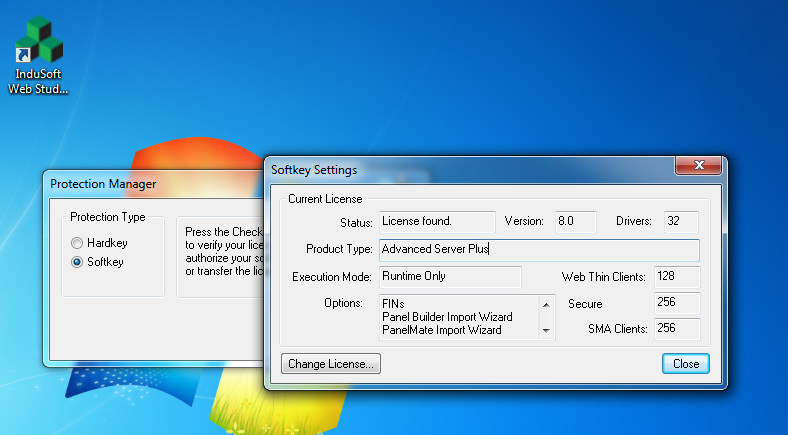 Change soft licence, copy the site code and paste in the site key text area. Remove the two last numbers and replace them by '8888 3C' if you want runtime, '8889 3C' if you want runtime + engineering. Press OK, the site key must be accepted. Now the software must run correctly with a successful licence check at startup. I hope it will help some people! Anyone have a keygen or crack for Indusoft 7.0 ServicePack 1 ? 3.Run KeyGen - x64 . 4.Select Softkey and push Check. 5.You can use file "1.pdf" to help you to determine you license you prefer. Hello. My Site code is 950F 9549 1F5B 7750 FBC8 7A46 575E 7769 2A. Could you tel me my key, please. Thank you. Thanks. its perfectly work for InduSoft Web Studio v7.1 . but for InduSoft Web Studio v8.0 its don't work. please help me . I downloaded the Indusoft WebStudio 7.1 SP3 Patch 8 from the link below. Please generate the site key for me. Friends would like to help me with the Site Code 186F 13F5 E3F6 89D9 762F F554 F1B9 809C 57. Can you pls send me the site key for indusoft V7.1 sp2? Hi, to any could help. Please, I need a Site Key for Indusoft Web Studio. Any version it is possible. I have edited and repack keygen for indusoft 7.1 that has been shared on earlier post by other user. Complete with instruction step by step on it. Give me Site Key. Thanks in advance. Hello...Can you send me Site Key? Studio Manager displays : "C:\Windows\system32\Unlock.dll was not found"